Yesterday, my former registrar wrote a kind post over at the Samek Art Gallery blog. It's my first blog endorsement. I was the graduate assistant at the Samek Art Gallery for two years after college. The experience was the perfect blend of learning and getting thrown into the pool and being expected to swim. I keep an eye on the Samek via ye internets, and it's been growing by exciting leaps and bounds. The gallery has opened a downtown satellite on Market Street in Lewisburg, and there are now two graduate assistantship positions. I wanted to comment on the post, but I can't because I can no longer log into the Bucknell systems. Thanks for the internet-love! Thanks for sending folks my way, thanks for giving that fresh college grad who rode 2 days on a greyhound bus to get to an interview in Pennsylvania a chance, and thanks for trusting me with all that expensive art and that very large truck. I wouldn't be where I am today without the Samek. 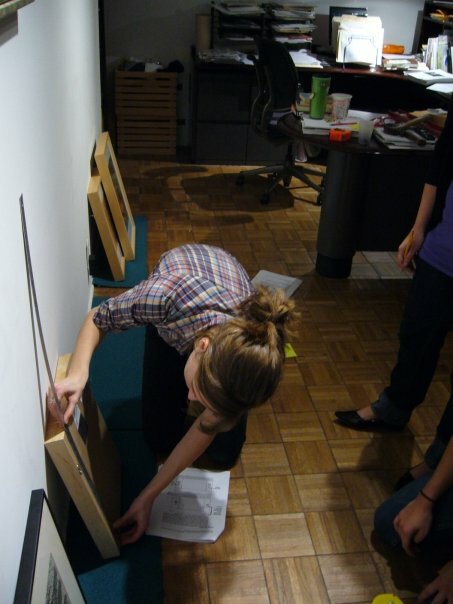 Me, teaching my class how to hang art. p.s. If you click on the link to the Samek post, that's me there with William Christenberry. One of the perks of working in a gallery is occasionally getting to meet the person who makes the art. Mr. Christenberry is a pivotal figure for any southern artist or kudzu-lover. He is a wonderful storyteller and an all-around lovely person. He regaled us with a story about Alex Chilton, William Eggleston, a convertible, and a toilet. It was an art happening in Memphis (and also the first date he had with his wife.) I would eventually get to see this footage at his exhibition at the Brooks Museum. It's amazing how things come full circle sometimes.